I've been off for a few weeks, I managed to find myself a new job but it's a 2 hour commute so not leaving me much time for fun. PS. has Cen eros'd to Mage yet? IT'S NOT IRONIC, ALANIS, IT'S JUST ANNOYING. 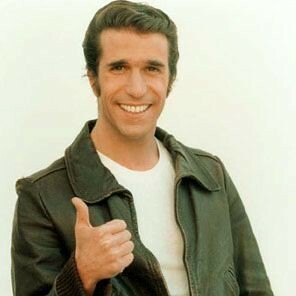 Wasn't Happy Days an American "comedy" soap opera with some 30 odd year old "college boy" called the Fonz? Mmmmm....didn't realise one could post photos. Wait.. he was SUPPOSED to be a student? Even when I was young and watching it I presumed he was meant to be some creepy old guy.. he was obvioulsly almost old enough to be some of the character's father. Just remember blib, before you start posting up pink bicycles... I have THAT picture of you. You know the one I mean! phpBB Created this page in 0.010853 seconds.